A full day to take the best shots of the scenic Mt Fuji and have cultural experiences. In this activity you can choose on either spending the day around the most popular Lake Kawaguchi and five lakes of Mt Fuji, starting from a perfect shot at the Arakurasengen Park for a panoramic view of Mt Fuji and the five-story pagoda on your background etc,. The other choice will be Hakone well-known place for its hot spring resort, Hakone Shrine with its torii gate standing on the Lake Ashi where cruising is also recommended and ride a ropeway to reach for another scenic view from 1327 meter high. Your guide will be picking you up at your requested central location in Tokyo at 8:30 am. Lunch will be served with the local traditional dish of the region at your expense. Please tell us how you would like to spend your day and we will be happy to give you the best of it. Visit Fuji World Heritage center to explore about the history of Mt Fuji and its worship culture, which will be giving you a quick outline of the region and culture. Venture into Arakura Sengen Shrine to take Mt. Fuji with its famous five-story pagoda. It is a year-round scenic point. 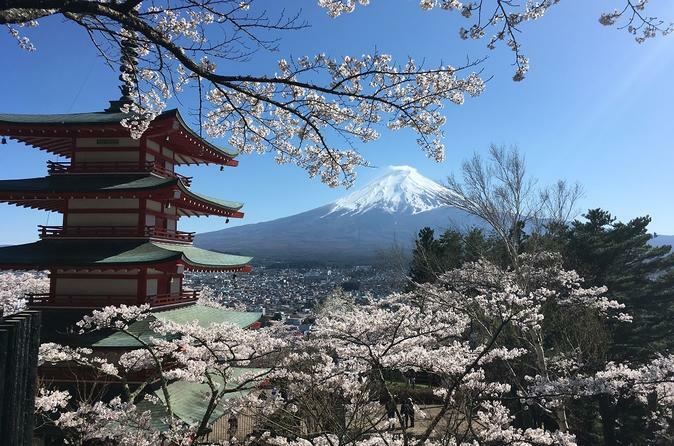 You can enjoy views of Mt Fuji with cherry blossoms in April and maple tree leaves turning red in November. See Oshino Hakkai village with traditional thatched roof houses and check out the wonderfully clear ponds formed by the water of Mt Fuji. Witness Ooishi Park another scenic view with this time Lake Kawaguchi and shop at Hanaterasu, cozy mall designed by a local artist just opened in summer 2017 to find traditional local craftwork and maybe have a coffee break where a barista will be waiting. Itchiku Kubota museum, not only his creation kimono but the museum itself is a whole artwork. From the Japanese style garden at the entrance, you will already be attracted by Itshiku's world. It is only here that you can see his beautiful kimono. Sake brewery and whiskey distillery to visit. We can have a stop to try sake made with Fuji water or Whiskey at Kirin distillery. You may also have a tour in the distillery if you let us know in advance. Narusawa ice cave and Wind Cave. And more places to have a scenic view of the day and alternatives on a difficult cloudy day. Enjoy a breathtaking viewpoint from a ridge. Visit Onshi Hakone park a Japanese style garden originally owned by the imperial family, now open to the public. Another stunning view of Mt Fuji with lake Ashi. Explore Hakone Shrine most visited Shinto shrine of the region, make a wish and thank the Shinto god and take pictures with the Torii red Shinto gate rising from the lake. If you are lucky you might be able to see traditional festival too. Komagatake ropeway to catch another scenic view from 1327m meter high, definitely one of the best views when the sky clears up. Be prepared to cover up yourself because the temperature is much lower. Lake cruising on the famous pirate ship or on a regular cruiser and it will be from the regular ship that you can actually take the surreal shot of the pirate ship in Lake Ashi. See the volcanic activity at Owakudani Valley and eat the black egg boiled from the hot spring. The story tells that if you eat one egg you will live 7 years longer. Experience yourself or just get some as a souvenir, the local craftwork Yosegi Tsukuri, only found in Hakone using different types of trees to make patterns with natural color. Visit the beautiful Japanese castle of Odawara owned by the powerful feudal lord, Hojo family. If you wish, you can end your day relaxing in a hot spring like the locals do after their journey before heading back to the busy city.